By Saturday night — closing night at SXSW — most people’s exhaustion is likely to get the better of them. Sometimes, those breakdowns happen quite a bit earlier. By now, it’s been well documented that California buzz band Foxygen canceled all of their Saturday shows, and earlier in the week got in a verbal spat with an audience member. But while that may be an extreme example, it’s really not that much more extreme than the wear-and-tear that begins to show on people’s faces and body language on the last day of the fest. Much of the city is in extended hangover mode, keeping dark sunglasses on indoors and tucking into corners where available. Making it that much worse was the humid, 85-degree heat, which had only arrived in time to sap the remaining daytime energy from anyone intent on getting one more day of music and parties under their belts. Coincidentally, Saturday night is also the time when a slew of last-minute secret and/or underpublicized shows by marquee acts takes place. Two days prior, MySpace announced that Justin Timberlake would be headlining their final Secret Show of the week. Billy Corgan and whatever incarnation of Smashing Pumpkins is active right now played an outdoor show just down the street from the Convention Center (we saw a little from outside the venue — we heard no hits, just what sounded like extended prog-rock jams). But the most talked-about show of the week? Prince, who played a private, highly exclusive Samsung-sponsored show, opened by A Tribe Called Quest, no less. I’ll admit — that would have been cool to see. But I also know that, had I given it a little more forethought, I could have seen Prince at one of 30 shows in Los Angeles in 2011. I can also see Justin Timberlake with Jay-Z this summer. And I can probably see Smashing Pumpkins, but I’m not sure I want to. That prospect had a lot more appeal between 1993 and 1997. So on Saturday night, the South-by-Southwesterners were split into essentially three camps: 1. Those who would scrap their evening plans at the off chance to hear some megastar sloppy seconds; 2. Those who couldn’t get out of Austin fast enough; or 3. Those of us who would rather do what we came here to do in the first place — explore new music, see artists we’ve never seen live before, and seek out an experience that exists outside the hype, industry nepotism and editorial redundancy. We can’t guarantee that we succeeded 100 percent on all counts — we did, after all, make an exception to our “no mega-acts” rule this week by watching Depeche Mode (totally worth it, we’re hypocrites, whatever) — but we think we did pretty well. Thanks for one hell of a week, Austin. With a fairly gross mixture of heat and humidity creating a highly unpleasant indie rock schvitz at the Old Emo’s location, now just called The Main, the atmosphere seemed a little off for a lineup that featured the impassioned, atmospheric R&B of Arthur Ashin, better known as Autre Ne Veut. Yet, in spite of the perfect storm of potential to underwhelm, Ashin, his drummer and backup singer cut straight through the Saturday afternoon malaise with dreamy, sensual, yet emotionally exhausting electro-soul. The key to Ashin’s stage presence is his intensity — he doesn’t just sing, croon or serenade, he really belts these tunes like each one is the last he’ll ever sing. So when he and his bandmates ease into a highlight from new album Anxiety, like “Play By Play,” he’s not just putting on a show, he’s seemingly tapping into something more than mere vocal ability. It’s cathartic — overwhelming even — but damn does it feel good. Just ask the guy having a pop-and-lockdown in front of me. 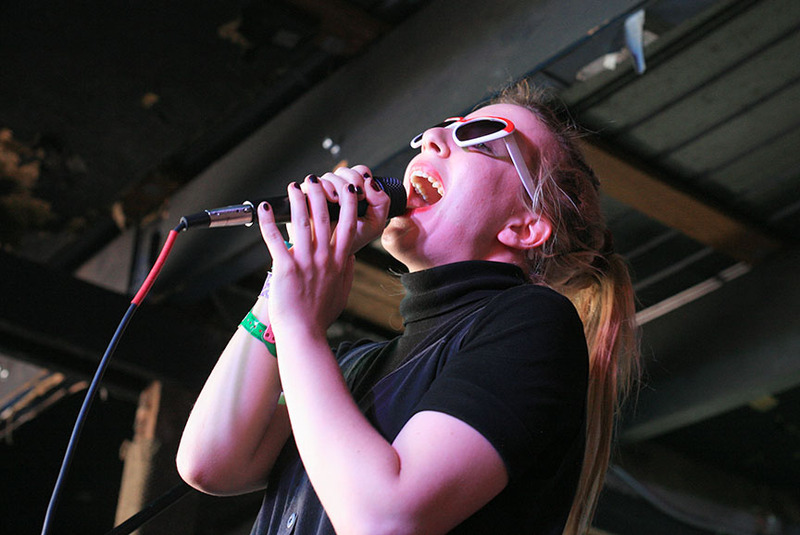 One of the highlights of Treble’s 2011 trip to Austin for SXSW was catching Austra a few months ahead of the release of their debut album, Feel It Break. So we’re about one more Austin Austra show away from it becoming tradition. This time around, the goth-tinged Canadian synth-pop group premiered several new songs from their upcoming album, most of which had a decidedly more dance-heavy, less overtly dark tone about them. Frontwoman Katie Stelmanis even took the stage in a pair of heart-shaped sunglasses, suggesting that, perhaps, there are some brighter things ahead for the Toronto group. Many of these new jams, including “Home,” had the beats and the urgency to hit all the right spots — even if the hipster sauna only seemed to grow worse over the course of the afternoon — though the show’s highlights remained old favorites “Lose It” and “The Beat and the Pulse.” I don’t doubt the new tracks will become new favorites in time. Either way, no disappointments here. Just a few cuts into Merchandise’s umpteenth set of the week, at the Chaos in Tejas showcase at Red 7, frontman Carson Cox dispensed with a little bit of real talk. “We’re so tired of playing these songs,” he lamented, laughing off the mental exhaustion of a long week while still holding nothing back. Merchandise may have played a couple weeks’ worth of shows at SXSW, but they were still giving roughly 99 percent as the end drew near. An unfortunate bit of feedback kept creeping through the group’s set — comprising equal time from both last year’s Children of Desire and their upcoming Totale Night — yet some sound issues weren’t enough to keep them from giving a great performance all the same. New track “Anxiety’s Door” opened the set, unleashing an intensity right from the start, and “Totale Night” found the group inviting a saxophone player on stage to turn their darkly abrasive post-punk into fiery, unhinged no wave. With a pretty hefty tour schedule ahead of them, they won’t be freed of the duty of having to play these songs for a while, but if it’s any consolation, they still sounded really good! Technical issues, sound problems and any number of performance mishaps are bound to happen at a festival with thousands of artists and somewhere around 100 venues, with no two set-ups being exactly alike. It’s a wonder that it doesn’t happen more often actually, though it’s to the credit of all involved that, by and large, the majority of shows at SXSW are essentially hitch-free. For South Africa’s Petite Noir — who traveled quite some distance to get to Austin — things got off to a rocky start at their Terrible/True Panther showcase set. Guitar pedals, amps and possibly cables were failing, and midway through their first song, the group was performing at about 75 percent. Still, they never groaned about it or took out their frustrations on the audience. Rather, they simply kept going until the issue was resolved, and in the process, delivered a lovely selection of dreamy pop tunes backed with exotic rhythms, including last year’s breakout single, “Till We Ghosts.” The band’s recorded output is still minimal but definitely something to look out for in the coming year or so. Remove the side effects of chance at an often chaotic fest like SXSW, and they’ll be well on their way. Brooklyn rapper Le1f has been quickly building up a head of hype-steam via a handful of well-received mixtapes and mega-jams like last year’s “Wut,” and it’s no mystery why he’s been setting off OMG-alarms — the guy is a true dynamo. An openly-gay emcee (which once was fairly unheard of in hip-hop), Le1f doesn’t just rap, he puts on a vibrant, high-energy show that amounts to something even more amazing in person than it is through headphones. Basically, he’s everywhere. 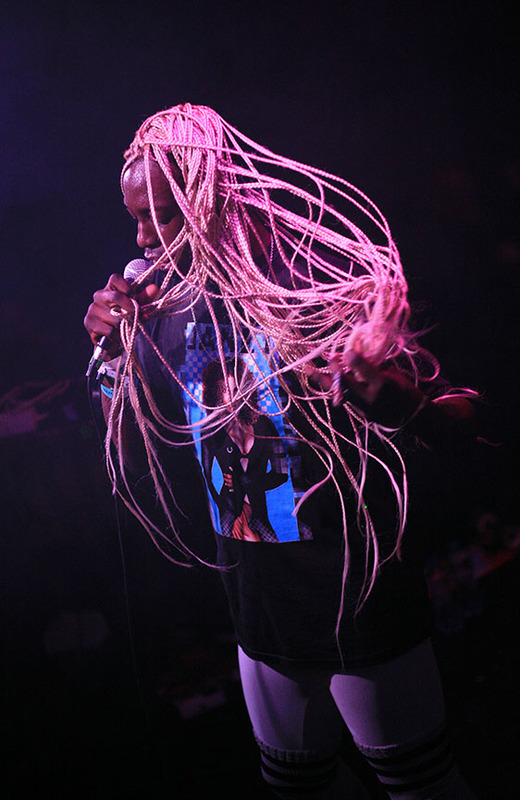 With long blonde braids draped underneath his “BASED” cap, and a Janet Jackson t-shirt, Le1f’s presence appears larger-than-life before he even starts moving. But when he moves, he’s everywhere. He’s bouncing, slithering, crawling, hopping and, ultimately, unleashing those long braids of his so he can whip them in circles. 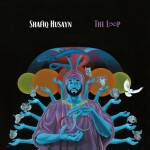 Add to that his lyrical firepower and you’ve got a live act that ranks as one of the most memorable all week. Surely others have called Le1f the future of hip-hop; they’re right, you know. At midnight, buzz-chasers could have been just about anywhere Saturday at SXSW, sopping up Billy Corgan solos from a sidewalk, trying to sneak a peak at Justin Timberlake, or simply soaking in the aura of Prince. 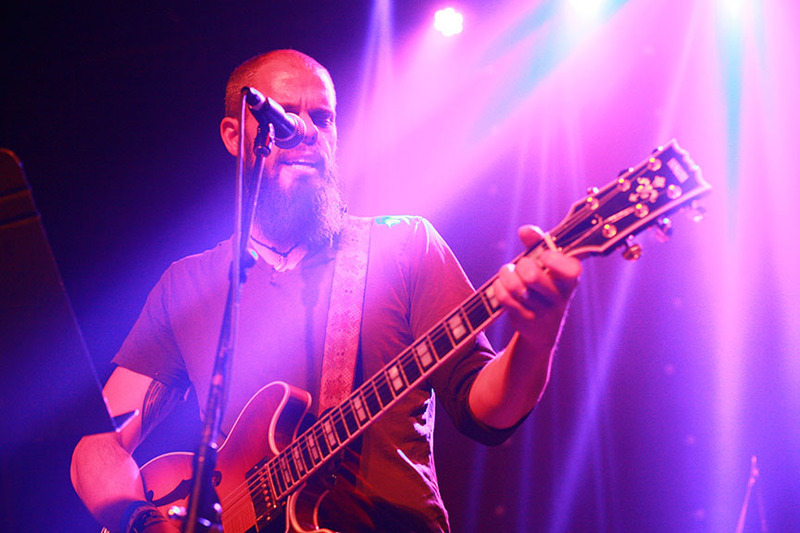 They’re relatively unusual — even unique — but having a glimpse of Prince wasn’t even close to good enough to be able to derail our plans for the closing night of SXSW: seeing Baroness’ John Baizley in one of only a few solo shows performed this year after a long recovery from last year’s devastating bus crash. As the set ended, the two shared an embrace, and Baizley gave a heartfelt thanks to everyone who showed their support during a difficult time for the band. The warmth in the room grew stronger than the heat of Austin itself, and frankly, I found myself a little choked up when it was over. That’s the way you end SXSW — you offer something free of industry nonsense, privelege, exclusivity and hype. John Baizley gave us something genuine, something real. 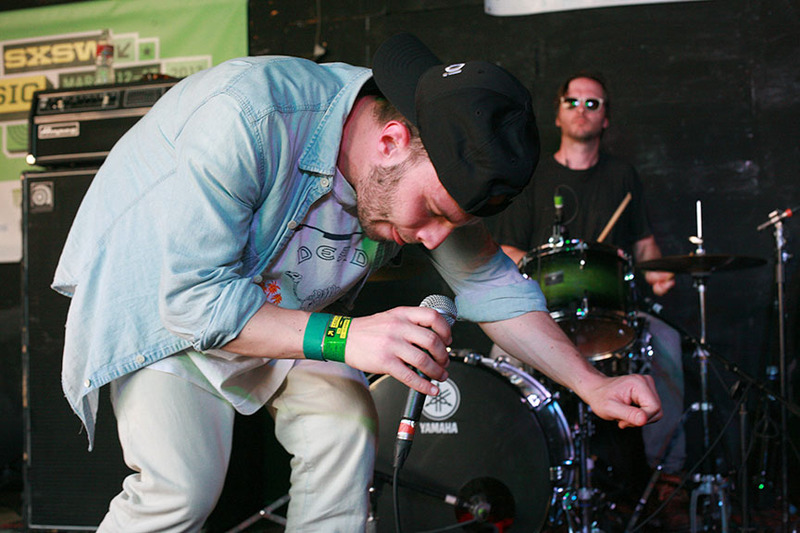 View the complete photo gallery from Saturday night at SXSW 2013.